also advertised the Seneca Falls Iron Well Pumps and offered to install the machines in wells. be known as the Baker Manufacturing Company. The firm became known world wide for its windmills. the hardware merchants shipped to cheese factories in neighboring communities. product for both the manufacturer and merchants. building lots. They called it the Leonard and Mygatt Subdivision. lying along said street and running back to the pond, eleven rods wide and fifty-one rods long. Price paid $675. there were four new houses. the village. Mygatt and his wife, Cecilia, spent their winters in Georgia, as did Levi Leonard and his wife, Sarah. wife Cecelia, a modern and comfortable place to live and to entertain. small hospital for Dr. Evans, at the south end of the Pioneer Drug Store, 8 South Madison. redwood shingles and the flooring was purchased in Chicago. the work he had promised. Baker Manufacturing Company and the real estate. 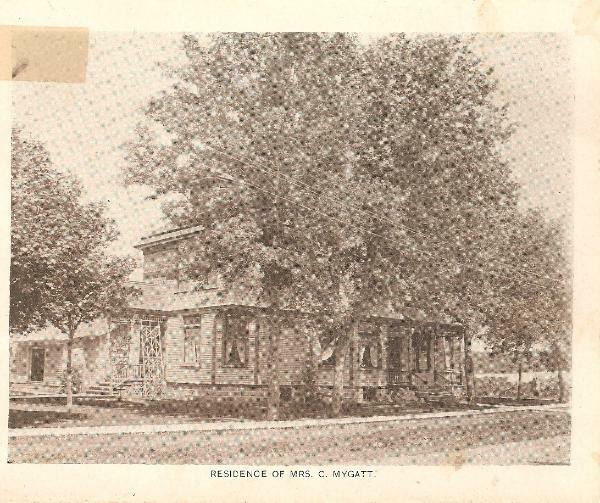 Mrs. Mygatt owned the home until her death in 1915.
on easy terms.” The home did not sell. to the Evansville Seminary to be used in their general fund and for scholarships. did not follow the wishes of her husband disposition of his estate. settled in favor of Elmer Garrett. described as lot 9, except the West 7.5 ft. of Block 4, original plat of Evansville. Eva Freuchen and Ada J. Johnson lived in the house at 204 West Main. They were daughters of Mr. and Mrs.
township and attended the Evansville Seminary. after Brigham died, Ada married Lyman H. Johnson of Brooklyn, Wisconsin. Johnson was a widower with children. their large and comfortable home. Magee Theater in Evansville in 1935. When he made speaking tours in the United States, Peter Freuchen often visited his cousin’s wife in Evansville. owned a farm northeast of Evansville. They retired to Evansville and sold their farm to their son, Vaughn. in Evansville in 1946 and later an associate professor at the Whitewater State College. West Main and a home in Whitewater. lived in the apartment on the second floor of the Main Street home. Star organization and the Evansville’s Woman’s Literary Club.